Kuvasz Fanciers of America, Inc. | "Keeping the Hungarian in Kuvasz"
Welcome to Kuvasz Fanciers of America! Kuvasz Fanciers of America, Inc., an IRS 501(c)(3) charity, is dedicated to the preservation and promotion of the authentic Hungarian Kuvasz. KFA believes it is vital that the Kuvasz remains true to its heritage. 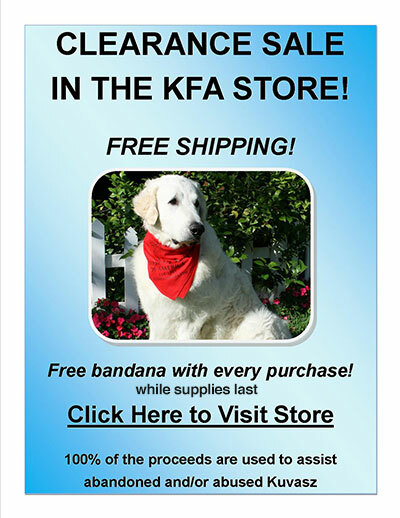 Founded in 1985, KFA also supports and promotes ethical breeder conduct, actively rescues abandoned and abused Kuvasz, provides public education, and sponsors Kuvasz events and activities.